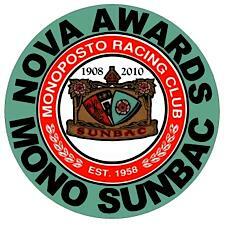 The Monoposto SUNBAC Nova Award continues in 2012, and the winning novice drivers will win some race entries for the 2013 season. Marcus Sheard won the 2011 award, with Mat Jordan finishing as runner up. Each eligible driver, accrues class points towards the Nova Award, subject to number of race starters as per Monoposto regulation 1.6.1. As per Monoposto Class Championships, the best 11 of 13 results will count. After two rounds Luke Rosewell heads the standings, with Adrian Heath just one point behind. Christian Parker is third.